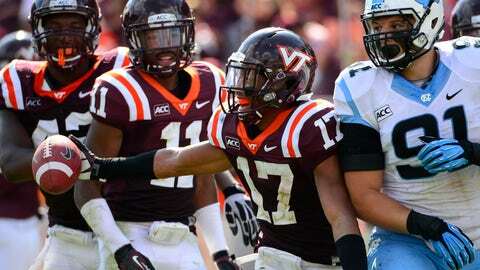 Kendall Fuller leads the Hokies' fourth-ranked defense with six interceptions and is fourth with 56 tackles. Virginia Tech hasn’t been able to run the ball this season. Against anyone. Well, that’s not true. it did put up 183 yards on the ground against Miami. Nearly 30 percent of all the Hokies’ rushing yards (and half their rushing touchdowns) came in two games — one against FCS Western Carolina, the other vs. those Hurricanes. But the Hokies have been three-yards-and-a-cloud-of-dust most of this season. UCLA’s defense has the personnel and the ability to limit what Virginia Tech wants to do offensively, but it’s not impenetrable. The Bruins are 56th nationally in total defense (392.8 yards per game) and 73rd in rushing defense (171.7), but it hasn’t mattered who Virginia Tech is facing this season. When the Hokies struggle to move the ball, it’s because quarterback Logan Thomas has to do too much and they can’t get a running game going with their traditional backs, instead forcing Thomas to take every carry. The Hokie defense has been fantastic most of this season, but it hasn’t mattered in some games when the offense either can’t move the football or can’t stop turning the ball over. The Hokie offense is going to have to step up in this game to give the team a chance. It’s time to see how far coordinator Scot Loeffler and this offense have come this season, and perhaps give Hokie fans who were clamoring for a change on that side of the ball reason for optimism going forward. There aren’t many two-way players left in college football, and for good reason. But even the ones who see action on both offense and defense rarely see more than spot duty on at least one side of the ball. Not UCLA’s Myles Jack, who won the Pac-12 Offensive and Defensive Rookie of the Year Awards. A linebacker/running back, he finished the season with 37 carries for 267 yards and seven touchdowns, all of that in the last four games. He also has 70 tackles (5.0 for loss) and leads the team in both pass breakups and passes defended. At linebacker. He prefers defense (yet another rarity in today’s game), but he’s a special talent. 13 — Prior to this season, Thomas said he wanted to have five or fewer interceptions this season. He had passed that mark by the fourth game this year. To his credit, he had just one in his last three ames, but obviously this year didn’t turn out quite like he wanted. There’s no telling which version of Virginia Tech shows up in this game. Traditionally, the Hokies have been pretty good in bowl games under Frank Beamer. But this season has been far from traditional by Hokie standards. It’s been a season of inconsistency, as the Hokies played Alabama tough, struggled with ECU and Marshall, then beat a surging Georgia Tech team before losing three of their final five games to teams like Duke, Boston College and Maryland. Those wouldn’t have been so strange, if they hadn’t dominated teams like North Carolina and Miami in the process, and if two of those three losses hadn’t been at home. Puzzling over the Hokies’ weird season is a waste of energy, particularly when UCLA’s has been so clear-cut — the Bruins have played five ranked teams and are 2-3 in those games, but have not lost to an unranked opponent. Why should that be any different in the bowl game? Ultimately, like it has most of this season, the burden will fall on Virginia Tech’s defense. And only two teams have really done that all season to the Bruins — Stanford and Oregon. UCLA had 400 yards or more in nine of its other 10 games, and 396 yards in the other. It’s asking too much for Virginia Tech’s offense to keep pace, or for the defense to win the game on its own.